As we continue to explore the spiritual practice of prayer this year, this month the word “difficult” frames our prayers. If you missed last week’s post, you may want to check it here. I have so enjoyed bringing some different voices to Healthy Spirituality through guest posts. I am delighted to introduce you to my friend, Kelly O’Dell Stanley. We met at a writers conference eons ago- we were both very green as writers – and I have been so blessed to watch her now blossom into a published writer and writer conference speaker. Be sure to check out her books and her blog! 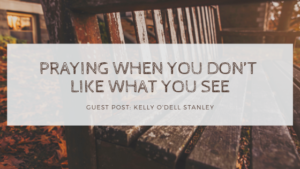 Kelly O’Dell Stanley is the author of Praying Upside Down and Designed to Pray. A graphic designer who writes (or is it a writer who designs? ), she’s also a redhead who’s pretty good at controlling her temper, a believer in doing everything to excess, and a professional wrestler of doubt and faith. She blogs at kellyostanley.com and calls small-town Indiana her home. When you stare at this image, do you see two faces in profile or a vase? In 1915, a Danish psychologist named Edgar Rubin developed this optical illusion. At the time, this was groundbreaking because it exemplified the fact that our brains can only focus on one image at a time—we either see the black vase or the two profiles. In order to see one, you have to stop looking at the other. Yet there’s no denying that the illustration contains both elements. I’ve heard numerous people in the church—and friends outside the church—talk about the fact that when they were in the worst trials of their lives, God had never felt closer. They were hyper-aware of His presence as they dealt with a scary diagnosis, or watched a brother die too young, or signed the papers that turned their wedding rings into meaningless pieces of jewelry. Years ago, after losing my mom to cancer, I wanted no part of praying to God. He didn’t hear me, after all, or Mom would still be alive. For the whole three years Mom fought, I didn’t feel God—I’m glad He was there for everyone else, but where was He when I needed Him? Finally, after months of pulling myself farther away from Him, becoming more and more cynical, I felt God prompting me to pray for my church, for the House of God. Easy peasy, right? I felt such relief—finally, I could stop thinking about Mom. …Until that morning when I lay on the floor at the altar of my empty church, alone in the sanctuary. I finally felt God’s presence again. And I saw the whole truth of the Rubin optical illusion. In the Garden of Gethsemane, as Jesus prepares to endure an unthinkable agony, He prays, “My Father! If it is possible, let this cup of suffering be taken away from me. Yet I want your will to be done, not mine” (Matthew 26:39). I’ve always believed that “this cup” refers to the roles God designed each of us to fulfill. What He has for us, what we have to endure. That day I understood that when we come face to face with God, a cup is formed between us. Jesus himself didn’t like what God placed in His cup—yet He trusted God’s ways. This—losing my mom—was my cup. I didn’t have to like it, but it could only be borne by standing face to face with God. Since Mom died, I’ve felt untethered, no anchor, nothing to center me. So You had to remind me that You are the sustainer. I thought I’d be praying for this physical structure, these walls, this building—that we would work from the outside in. But You work from the inside out. Inside out and upside down. That explained the problem with my prayers—God’s answers didn’t match the ones I wanted so I concluded that He wasn’t who I thought He was. Losing Mom couldn’t be the right answer so You must be wrong. It was as if I were looking at a blue wall and refusing to admit it was blue because I wanted it to be green. I had decided my world would never feel right again without my mom and that wasn’t okay with me. Turning toward God was like saying it was. I thought that if I prayed, I was a hypocrite. If I claimed God was good when I thought He’d done badly, then I was lying. Or deluded. I can see it as clear as day now: God standing right behind me, arms stretched wide open, never leaving my side, crying along with me, absorbing my pain as His own. Waiting patiently for me to turn and see Him, to realize He’d been there all along. He would never make me turn. I needed to do it myself. That’s how His grace works. I didn’t see Him there because my eyes were closed tight. Actually, God did answer my prayers. Living next door to my sister (which was another answer to prayer, but too long a story to tell here) made it easy for Kerry and me to help with each other’s kids while the other one drove Mom to chemo or radiation. Mom and Dad could stop by whenever they were in town and see us both. Mom’s love for us—and ours for her—was a given. The petty aggravations that had always had me slamming down the phone and shouting “AAARRGH!” no longer burdened me. One blessing of cancer: you let go of the little stuff that doesn’t matter. We thought we would only get a year or so, but we had three more years with her. My parents held hands wherever they walked together. Dad had the chance to be her rock, remaining unwavering and steady as she became more and more wobbly. Mom cursed her scratchy wig. She despised being and looking sick. But she served as a court-appointed special advocate anyway—always helping kids—and cheered her grandkids in soccer, swimming, baseball, theater, tennis, and basketball. The decline was very slow until the end, and then it came rapidly, with a huge answer to prayer. For three years, she’d been afraid of the end. She was a nurse, and she knew all that could happen to her body. She was petrified by the thought of suffocating as her lungs ceased to function. Instead, her whole body quietly gave out as she took slow, deep, peaceful breaths. She died at home, in the place she loved. Love. Family. An awareness of what we had. And, finally, freedom from pain. How had I ever convinced myself God wasn’t present? In the Rubin illustration, the chalice and faces share the same edges. You’ll see one or the other, depending on how you look at it, but the secondary object always remains because it can’t exist without its counterpart. When you sit down to pray, you’re only hurting yourself if you impose limits on God or set arbitrary guidelines for how God should behave. I learned the hard way. I was looking at the chalice (the events that were poured out) and denying the flip side—God’s face. In your situation, God may answer the way you expect Him to. Or not. But even when the answer isn’t what you hoped, you might be surprised how closely connected His answer is to your prayer. It’s just a matter of looking at the same thing—often what’s sitting right in front of you—from an unexpected point of view. Sometimes that means having to stretch your neck to see past a big, ugly hurdle. But what you’ll see at the end makes the stretch totally worth it. Wow, Kelly really brings this truth home, doesn’t she? Thank you for bringing us your insights and words today. How have you prayed when you don’t like what you see?